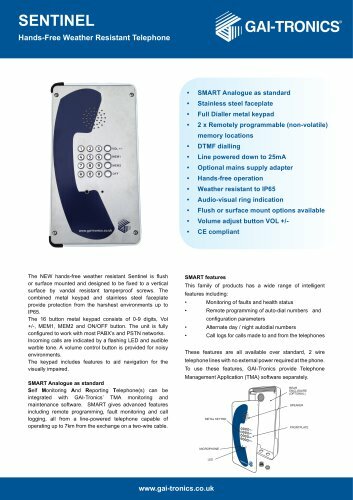 SENTINEL Hands-Free Weather Resistant Telephone SMART Analogue as standard Stainless steel faceplate Full Dialler metal keypad 2 x Remotely programmable (non-volatile) memory locations Optional mains supply adapter Hands-free operation Audio-visual ring indication Flush or surface mount options available Volume adjust button VOL +/- SMART Analogue as standard Self Monitoring And Reporting Telephone(s) can be integrated with GAI-Tronics’ TMA monitoring and maintenance software. SMART gives advanced features including remote programming, fault monitoring and call logging, all from a line-powered telephone capable of operating up to 7km from the exchange on a two-wire cable. Line powered down to 25mA The NEW hands-free weather resistant Sentinel is flush or surface mounted and designed to be fixed to a vertical surface by vandal resistant tamperproof screws. The combined metal keypad and stainless steel faceplate provide protection from the harshest environments up to IP65. The 16 button metal keypad consists of 0-9 digits, Vol +/-, MEM1, MEM2 and ON/OFF button. The unit is fully configured to work with most PABX’s and PSTN networks. Incoming calls are indicated by a flashing LED and audible warble tone. A volume control button is provided for noisy environments. The keypad includes features to aid navigation for the visually impaired. DTMF dialling SMART features This family of products has a wide range of intelligent features including: • Monitoring of faults and health status Remote programming of auto-dial numbers and configuration parameters Alternate day / night autodial numbers Call logs for calls made to and from the telephones These features are all available over standard, 2 wire telephone lines with no external power required at the phone. To use these features, GAI-Tronics provide Telephone Management Application (TMA) software separately.